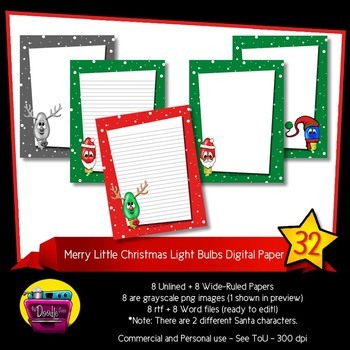 By request, these sweet little light bulbs are now on digital papers! 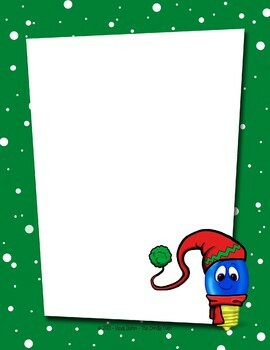 These are great for short stories, journaling, PenPal letters, notes home, notes to staff, etc. *Note: There are 2 different Santa characters. Commercial and Personal use - See ToU - 300 dpi - Word, rtf, and png files included. You may use these for personal and commercial items, but certain restrictions and requirements may apply. Please give proper credit. You will receive a .zip file containing everything. Please ensure you unzip/extract all items to use them. Please take a second to leave your comments and feedback. I would love to hear from you. Also, follow me to receive notifications about my other TpT products, freebies, and sales. Thanks for visiting and checking out my products. Be sure to get your FREE The Doodle Oven Credit button to give your resource credit page a polished and professional look.